We have a huge selection of great trails in the Flathead Valley, but these trails don’t maintain themselves. At trail work events, FAMB provides tools, but if you have a favorite implement of moving dirt, bring it along. BYO gloves, safety glasses, boots, and post-work refreshments. - Every Thursday from May 3-24, we'll be doing Dig Nights at Spencer from 6-8pm. Meet at the Twin Bridges trailhead. - Saturday, May 18th, FAMB and Great Northern Cycle will be hosting a pancake breakfast on the patio at GNC, then heading out for a trail work day afterwards. Stay tuned to our Facebook page and Events Calendar for more info! - Saturday, June 2 is National Trails Day. We'll be digging in the dirt for sure. Time and location TBD. 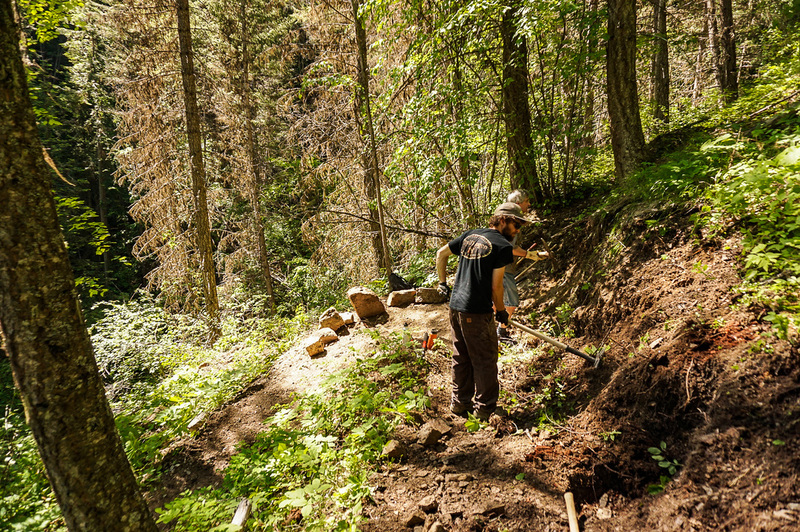 - Other trail days TBD - We'll add more trail work events to our Events Calendar. Shoot us an email at info@flatheadamb.org if you’d like to be notified of trail days. Check our Facebook page for event updates! Preserving and advancing mountain bike activities in the Flathead Valley.